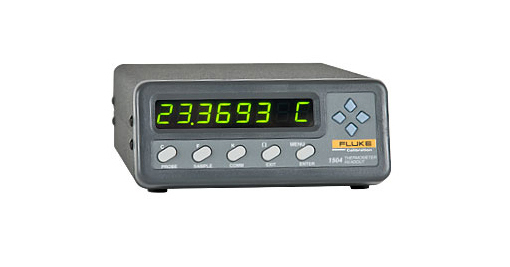 The 1502A “Tweener” reads 100-ohm, 25-ohm, and 10-ohm probes, and has a resolution of 0.001 across its entire range. It also has an optional battery pack for completely portable operation. 1502A.3110 Model 1502A Reference Thermometer, -200/420 °C, 0.001 Resolution, supplied with Hart Model 5615-12-D Secondary Standard PRT, 12″ length, 1/4″ diameter. Supplied with NIST traceable, ISO/IEC 17025 accredited calibration report @ -20, 0, 50, 100 & 150 °C and storage case. 1502A.3112 Model 1502A Reference Thermometer, -200/420 °C, 0.001 Resolution, supplied with Hart Model 5615-12-D Secondary Standard PRT, 12″ length, 1/4″ diameter. Supplied with NIST traceable, ISO/IEC 17025 accredited calibration report @ -50, -20, 0, 50, 100, 150 and 200 °C and storage case. 1502A.80010 Model 1502A Reference Thermometer, -200/420 °C, 0.001 Resolution, supplied with Hart Model 5615-12-D Secondary Standard PRT, 12″ length, 1/4″ diameter. Supplied with NIST traceable, ISO/IEC 17025 accredited calibration report at the boiling point of liquid nitrogen (approx. -196 °C), the mercury triple point (approx. -38.834 °C), TPW (triple point of water, or 0.01 °C), 200 and 400 °C and storage case.